We left Dingle in the beautiful morning sunshine. We were so excited to be heading to Portmagee! We took our time driving the Wild Atlantic Way because there is so much to see and do along the way. This man was painting local Irish scenes at the side of the road. We stopped and I bought one. This is the painting I bought. But why did he have to write the price in blue INK at the top of it? Dog and donkey waiting on the side of the road for their next photo op. 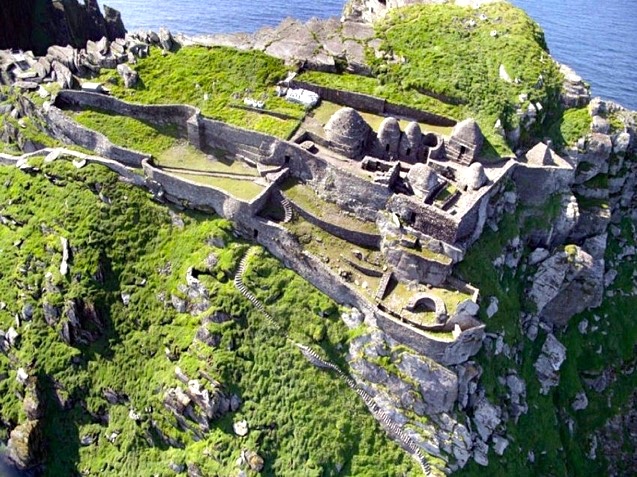 Ten years ago, Joe had seen a National Geographic documentary about Skellig Michael; the 7th century monastic settlement perched on a small, rocky island just off the Irish coast near Portmagee. He was fascinated with it and once we landed in Ireland booked us passage on one of the boats. We were set. Joe even bought himself a proper raincoat so he didn't have to suffer the humiliation of wearing another one of those vinyl rain ponchos that we wore on Inisheer Island. Me, on the other hand, had one of those crappy rain ponchos in my pocket in case of rain. We arrived in the tiny fishing village of Portmagee as giddy as school children. A very prestigious award to win. The view out our B&B bedroom window at 4:00pm on Saturday. The view out our B&B bedroom on Sunday at 8:00am. Halfway through breakfast it was announced that the boats would not sail to Michael Skellig today. Our faces fell. We were so disappointed! We quickly packed our bags and headed out for a quick tour around Portmagee and Valentia Island before leaving town. The highest cliffs in County Kerry. More high cliffs on Valentia Island. This was NOT worth 5 euros. What a mystical, magical place! The closest we got to Skellig Michael. For today, at least. Oh well! Better luck next time! Off to the south of Ireland and the village of Kinsale.